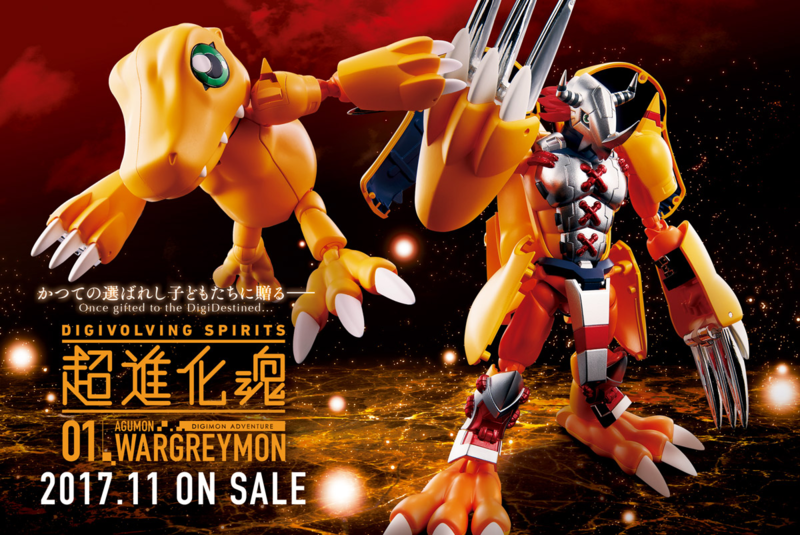 The third Digivolving Spirits figure, Diablomon! Released in March in Japan and scheduled for April in the US, Digivolving Spirits 03 Diablomon is the newest Digivolving Spirits figure. 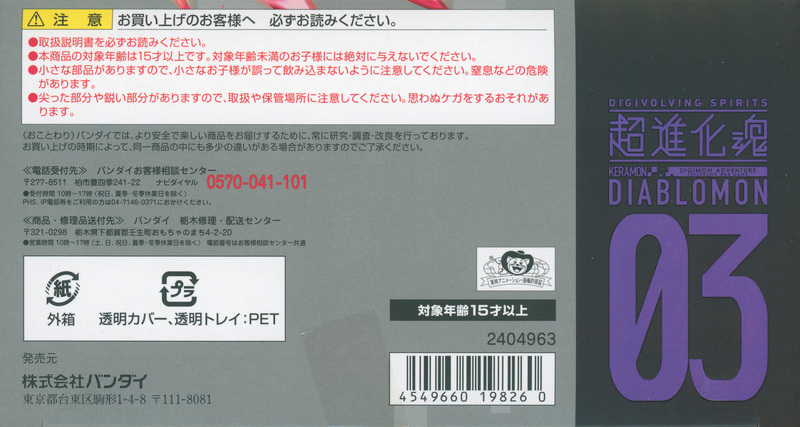 The scans went mostly fine, minus that the box is slightly slippery to the touch. Luckily I remembered this from WarGreymon and took it into account when I was scanning it. 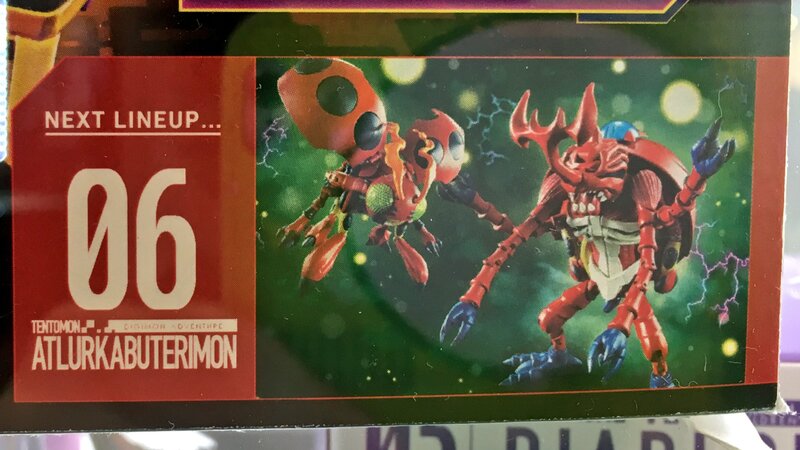 Up in the top left corner we also get a reflective Diecast Evolution 'plate' that they're putting on figures in the line to show off it having diecast metal. The bottom right corner has company logos, along with the logo for the second Digimon Adventure movie. 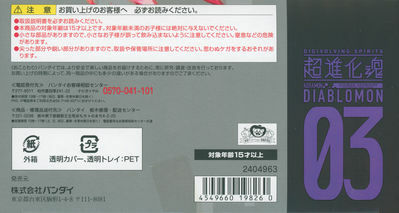 They use the translation "Children's War Game" in English for this release. One small additional touch is how Diablomon and Keramon are facing the opposite direction from the characters on the previous boxes, allowing them to face off against each other. A nice touch is that, unlike prior figures with the crest symbols, the side with Keramon gets a nice stylized clock motif. 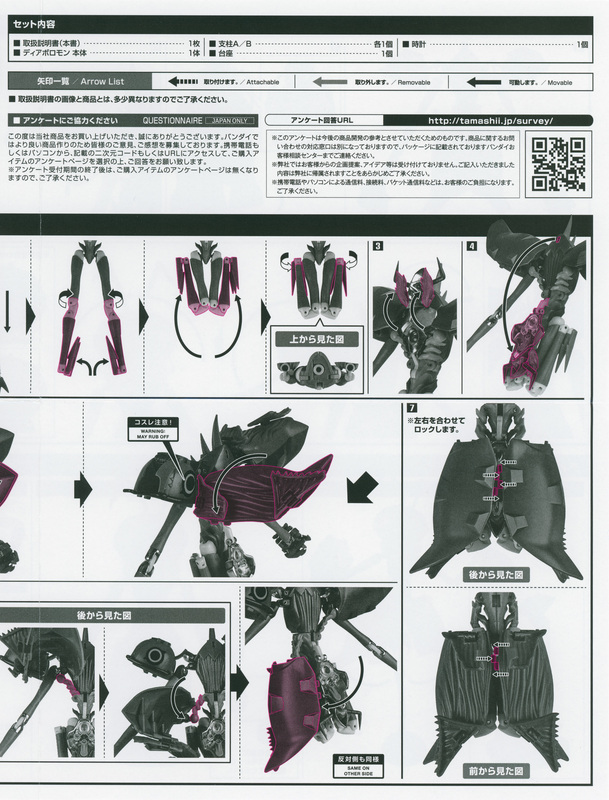 The top has the logo, along with silhouettes for the figures (along with more artwork that went past the edges on the front.) Very basic and nice. 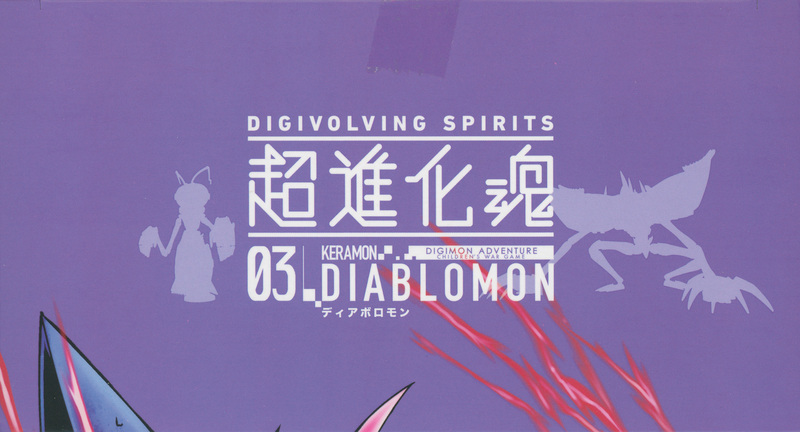 Most of the text is in both English and Japanese, and the small amount that isn't is the basic profile information for Keramon and Diablomon that we've all seen a number of times. 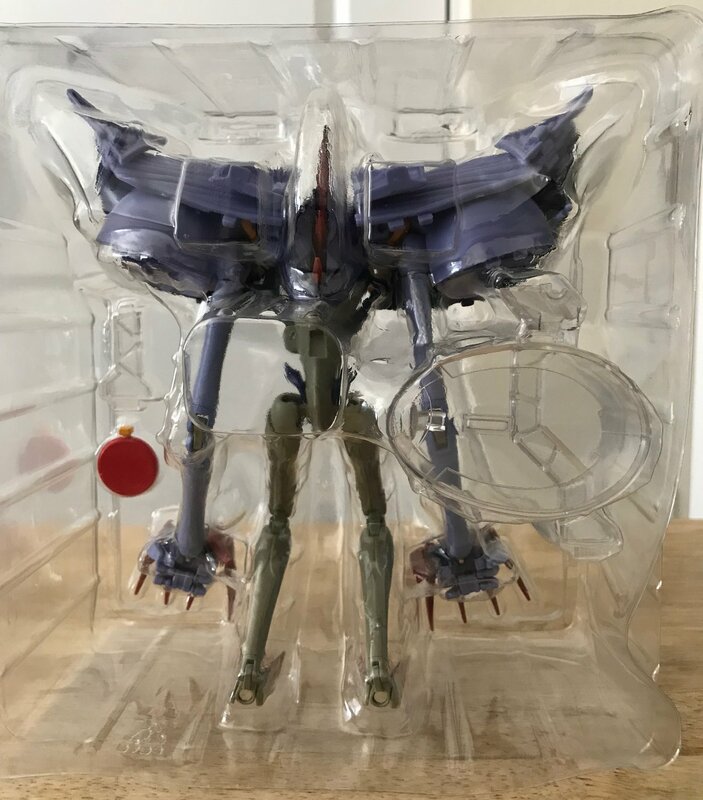 We also get a small preview of the fourth figure in the line, Angewomon! 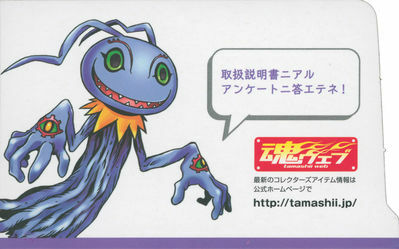 The left flap shows Diablomon, along with one of the clocks. This is included with cut guidelines in case they decide to do a campaign in the future that requires proof of purchase. 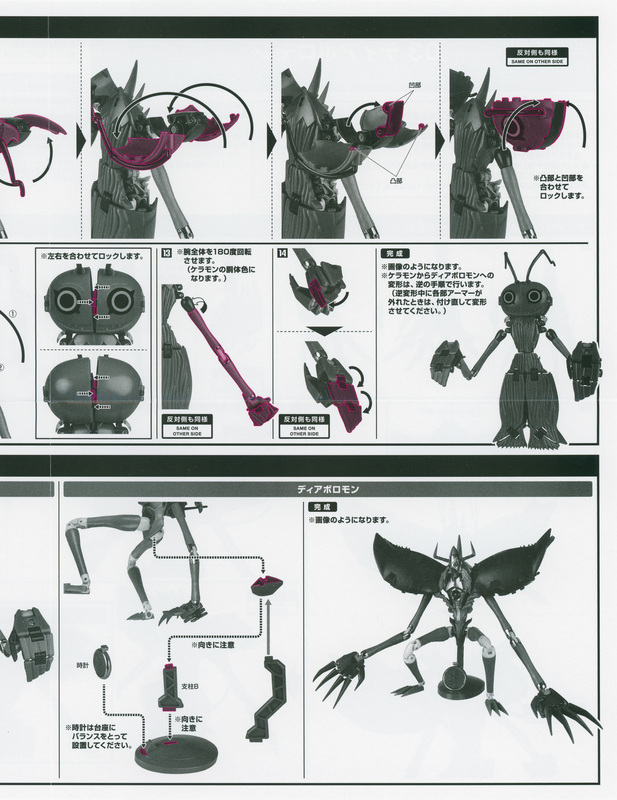 The right flap features Keramon! Keramon is asking buyers to please fill out the questionnaire that's included with the instructions. Which one has the clock? A 100% unnecessary touch that most people will likely never even notice. 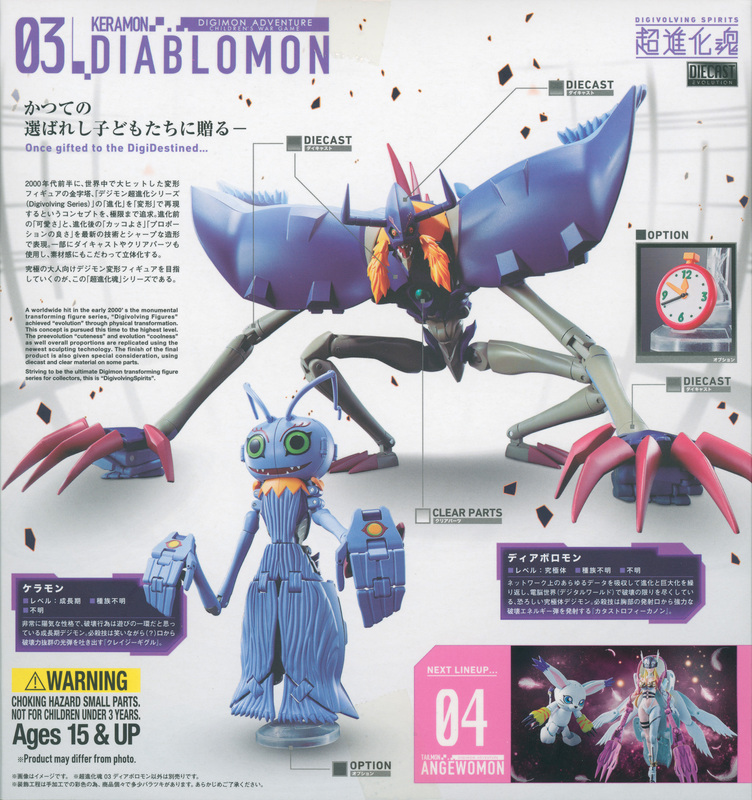 I said previously I couldn't wait to see what future figures would have there, and Diablomon's is perfect. 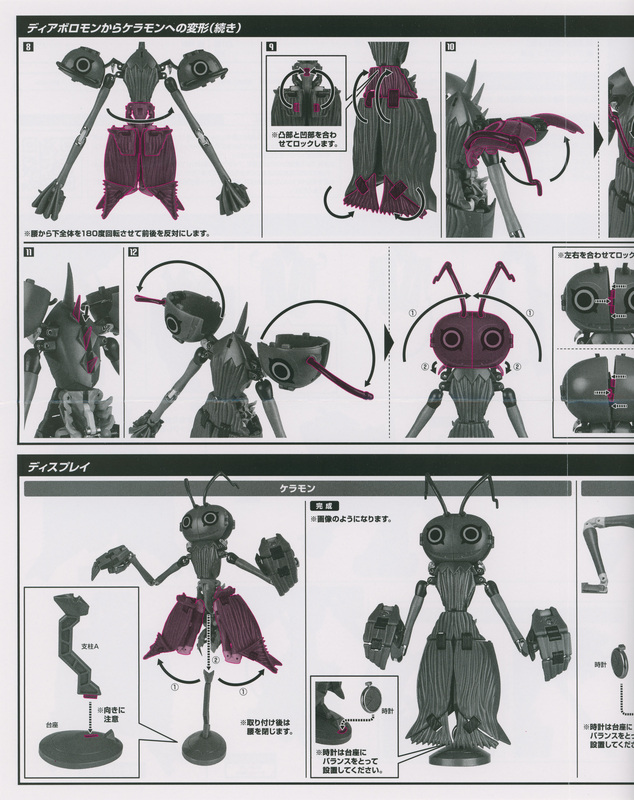 One touch that is nice is where they sketch outlines and highlight the areas they are talking about in a very crisp pinkish color to make it extra clear what parts they are referring to. 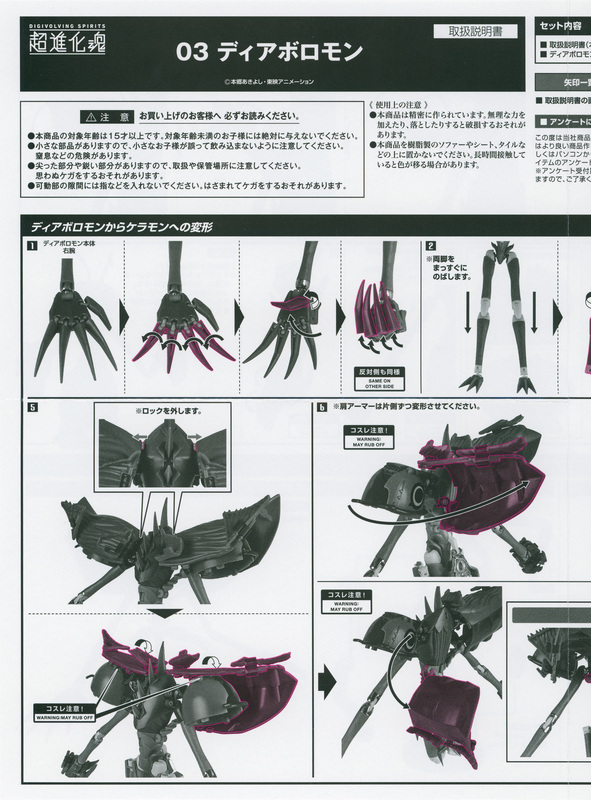 Like WarGreymon, it appears the instruction sheets used an unpainted prototype for their example. 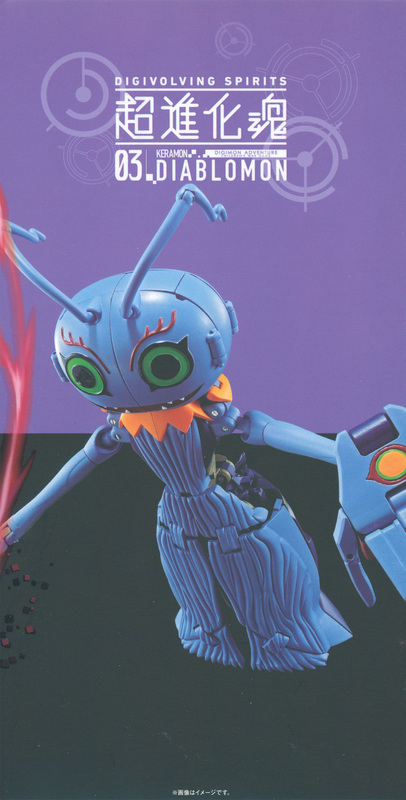 This is most noticeable on elements like Keramon's mouth and the bare metal visible on the clock. The stand is also not made of clear plastic. But I couldn't help myself to take a few from the figure still in the plastic shell once I removed that from the box. As the first figure that takes no inspiration from previous figures and has to stand completely on it's own, Diablomon really carries the line forward in a fantastic way. 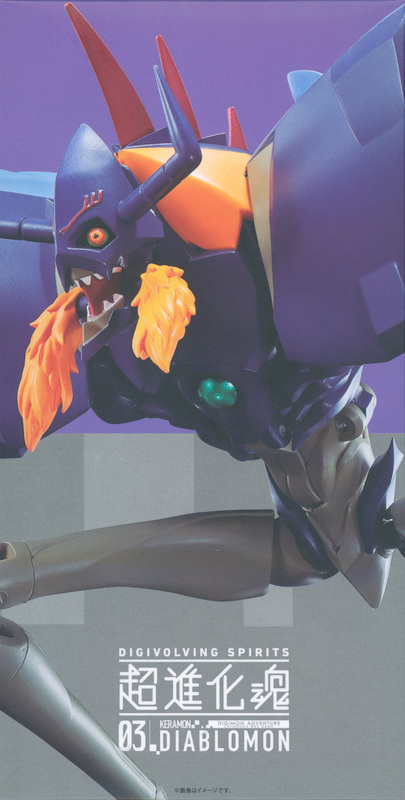 The detail we get for a high priced villain who has never had a proper figure before really makes me look forward to what we might get for various popular characters in the future. 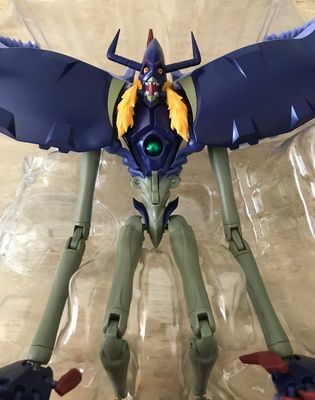 Angewomon and Alphamon are already up for pre-order but won't be out for awhile. 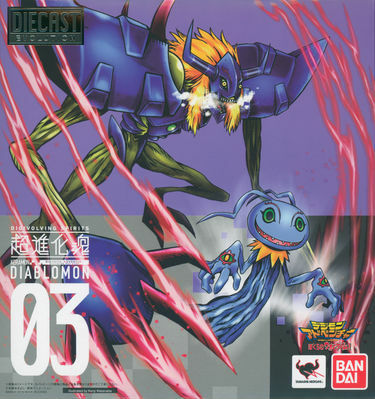 After Alphamon, we know that AtlurKabuterimon will be #06 followed by HolyAngemon and Dukemon. And we've seen art and/or prototypes for Garudamon, Lilymon, Zudomon, and Ouryumon. 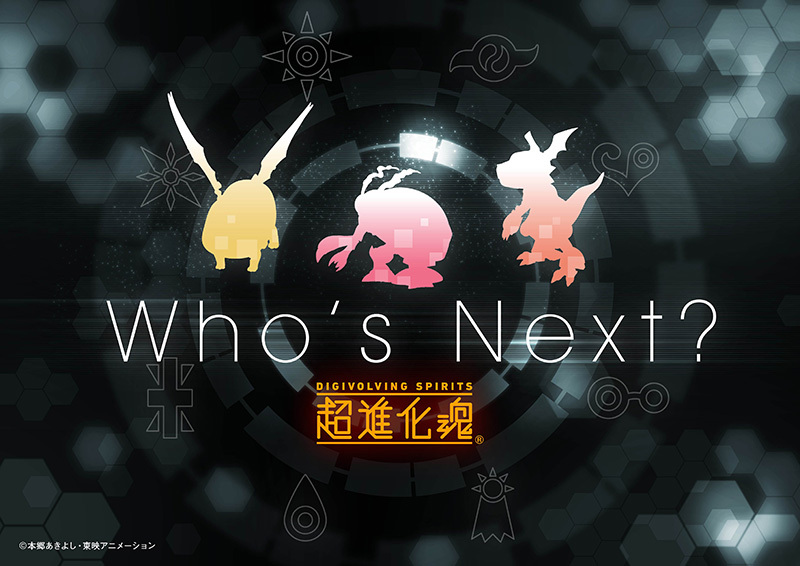 Images of all of them can be found here. 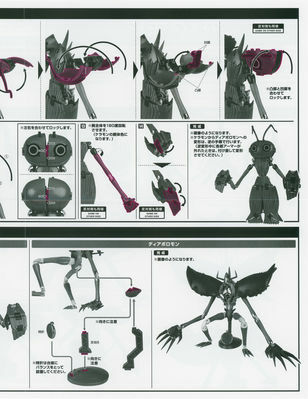 very nice breakdown. I bet your shelf looks so cool now. So this is what the product breakdown is that I saw on Patreon. That was pretty cool. Surpirsed there's some English in there but I guess that shows they always intended to release them in the west. 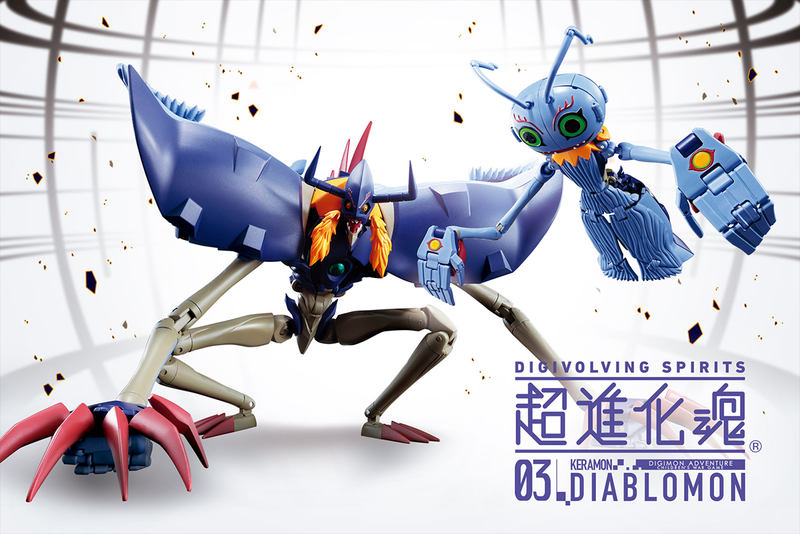 I do wonder if that means they'll be promoting it under the "Diablomon" name in the west though because that's not what people will search if they want a Diaboromon figure but I guess it's a product not many randoms would get since they're expensive etc. 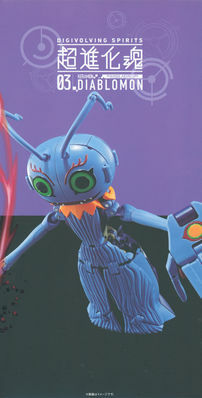 They're cool figures, especially since Wizardmon made them. That's the only explanation for how these were made. Surpirsed there's some English in there but I guess that shows they always intended to release them in the west. I do wonder if that means they'll be promoting it under the "Diablomon" name in the west though because that's not what people will search if they want a Diaboromon figure but I guess it's a product not many randoms would get since they're expensive etc. The prior two I ordered via American stock. 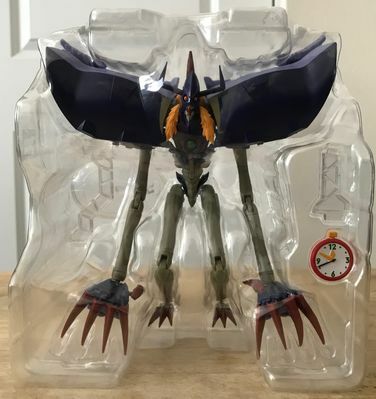 I had store credit from a Japanese shop, and at the time I pre-ordered it I legitimately wasn't sure if this was coming out in the US (at the time the only shops showing pre-orders were showing a March release, which matched the Japanese date.) Angewomon I also have pre-ordered via Japanese stock due to more store credit. 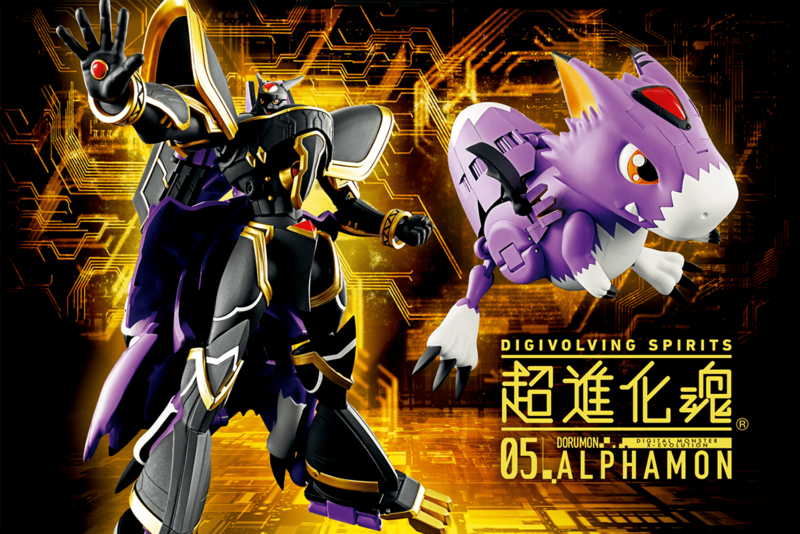 I haven't yet decided what I'll do for Alphamon yet. 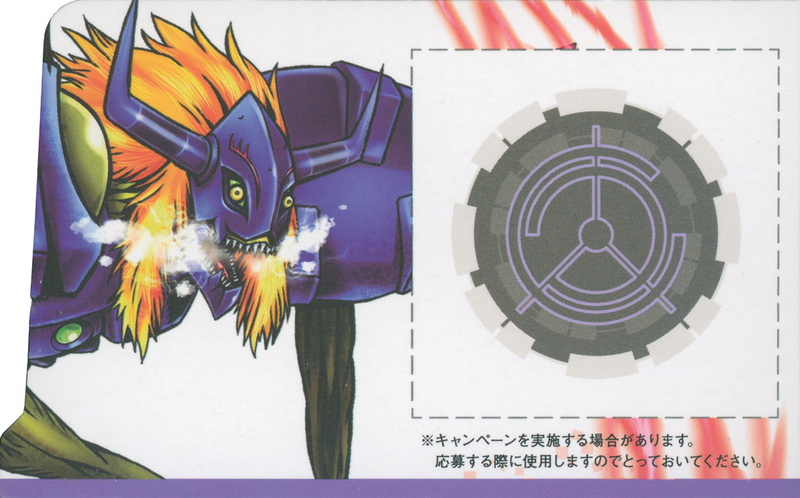 I wouldn't be shocked if US releases had an additional sticker mentioning Diaboromon, though I don't expect it. 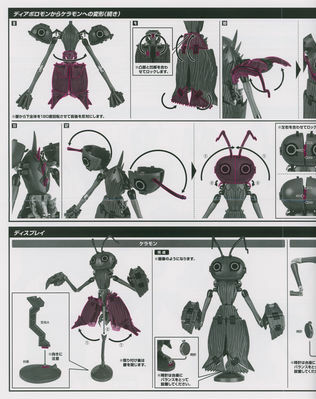 Ooh, he looks neat, though the instructions seem fairly daunting...but I doubt many people are going to be transforming them more than once or twice anyways. 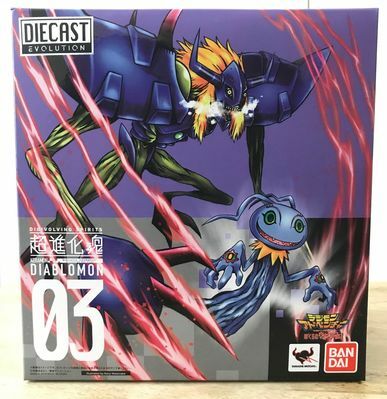 The box art is wonderful, as always. If I collected such things I would be inclined to just buy the boxes if anyone were crazy enough to part with the boxes and sell them separately. That sure looks cool. Really was surprised how they were able to do this one. I hate it when they package it in Mega Level mode. Why does Bandai do that? 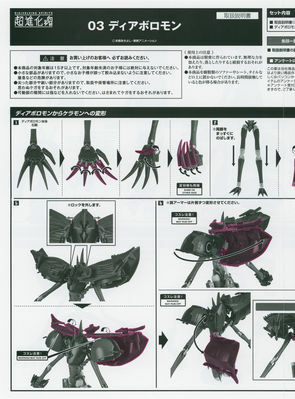 It makes complete sense because it's the more complex and more immediately presentable form of the figure. Obviously. It makes perfect sense. I think Transformers does that sometimes.